There’s less than two weeks left to apply for one of SIG’s graduate roles! In addition to our Graduate Quantitative Trader and Graduate Software Developer jobs, we’re excited to be hiring for Finance and Economics students will enjoy, Graduate Equity Research Analyst! Apply by 30th April here. Interested in winning $2,000 by doing what you enjoy? 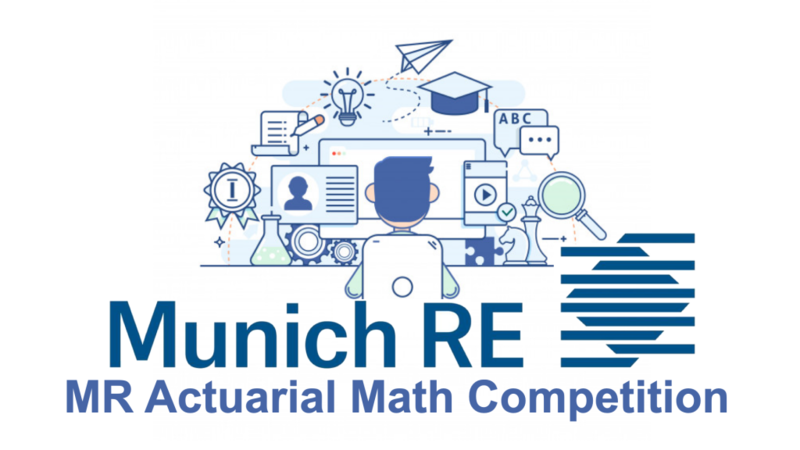 Munich RE Actuarial Math Competition is closing soon, so don’t miss out on this opportunity to win some awesome cash prizes. And many more for regional champions and high performers. Registrations close on 30th April 2019 and the contest will be held on 26th May 2019 at ANU. Registrations are FREE and Lucky Draw awaits you right after the exam! 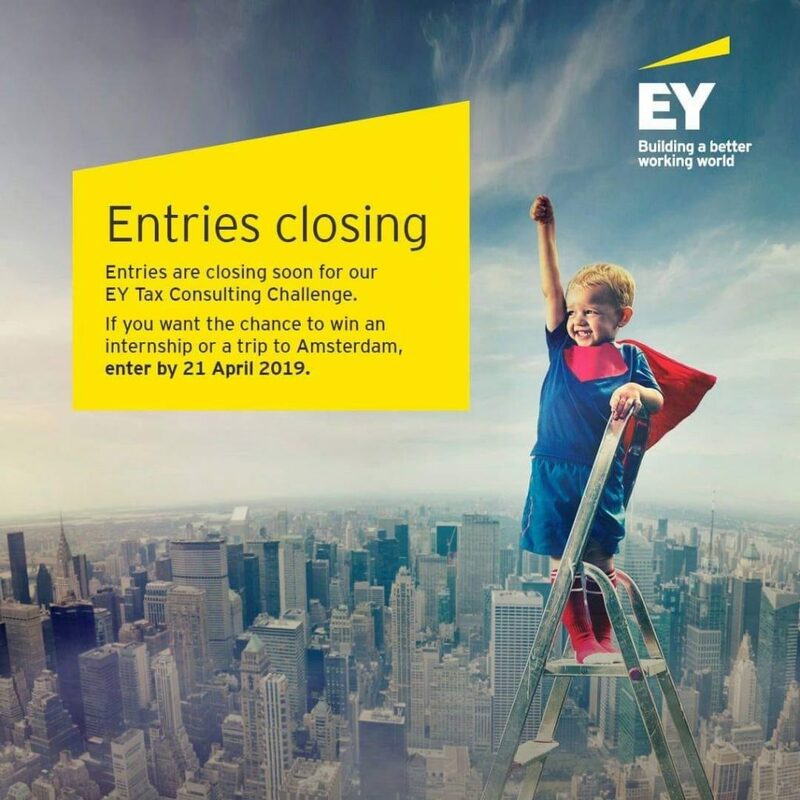 Entries for the EY Tax Consulting Challenge close at 11.59pm on Sunday (AEST). Take a look at the case study and see how you would answer it in 750 words or less. Submit your entry and you could be jetting off to Amsterdam in November. BCG Australia and New Zealand is proud to announce the official launch of their 2019 Scholarship Program! Do not miss this opportunity to apply for one of two $20,000 scholarships, and to potentially secure a graduate position with BCG! Last week, we invited Mark Hu to share his tips for preparing for the Munich Re Competition. Mark is an alumni who did Bachelor of Actuarial Studies and Honours of Statistics in ANU. Highly related to probability and statistics that we studied in STAT2001/6039. It is easier than the course. Remind yourself how to do joint distribution and discrete densities. Financial math similar to what we did in STAT 2032/6046. It contains both calculation questions and theory proof questions. Remind yourself of the meanings of notations and theories. Actuarial math, which is what we did in STAT 3037 Life contingency. About the difficulty of this test, it is not too hard but of course not too easy. But remember you are not allowed to bring cheat sheets, so you may want to remember some important formulas. And there are many questions, so do not worry if you can’t finish all of them. Just try to do as much as you can. As you already know, as long as you stay in the exam room till the last minute, you can enter the lucky draw and there is a chance to win BIG Prizes! Also, since the number of participants in Canberra is lower than other regions, it is relatively easier for you to win some PRIZE MONEY. 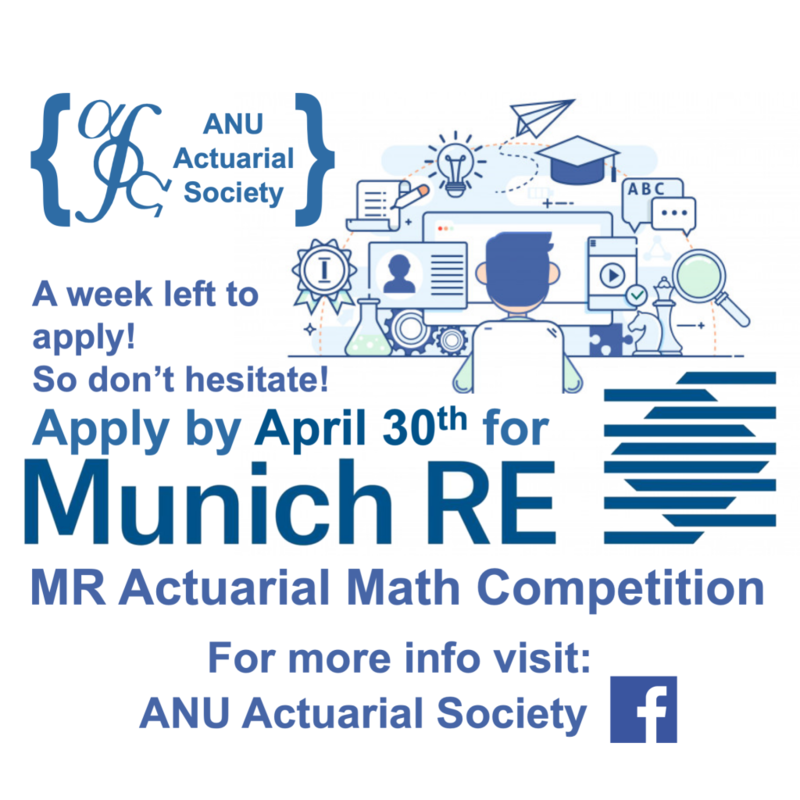 Winning the Competition also invites you to Munich Re to network with Chief Actuaries and most importantly, you will get an offer for an internship at Munich Re Beijing! You will learn how to use SQL, Access, and learn practical actuarial and insurance knowledge. For students whose home is not in Beijing, Munich Re provides FREE accommodation. How does that sound? Wishing you all the best of luck with the Competition, and achieving the score that you are aiming for. Have you heard about the EY Tax Consulting Challenge? Step into the shoes of an EY consultant and demonstrate your business acumen and analytical skills for your chance to win a Vacationer position, a trip to Amsterdam and an around the world business trip! Thinking about entering the EY Tax Consulting Challenge? 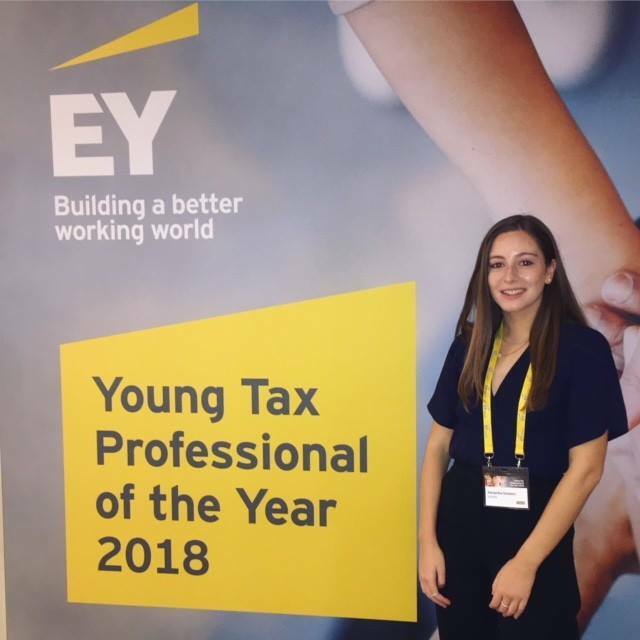 Last year, Sam Schwarz from Sydney University not only took out the Oceania title, but also won the EY Young Tax Professional Year global competition in Amsterdam! This month, Sam commences her winning 30-day global internship visiting 3 EY offices around the world! Interested in entering? Visit www.ey.com/au/TCC to find out more. Are you currently a second year and above student who has studied Actuarial Science, Statistics or Mathematics related courses? Do you have interest in or plan to engage in the insurance and actuarial industry? 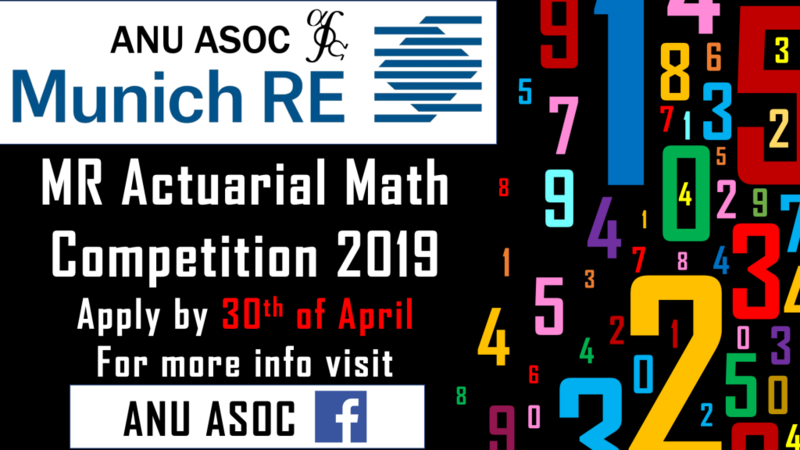 Partnering with ASOC, Munich Re will be hosting an actuarial maths competition at ANU. The contest will last for 120 mins and will consist of 3 modules. Registrations close on 30th April 2019 and the contest will be held on 26th May 2019 at ANU in room COPG030 between 16:00 and 18:00. 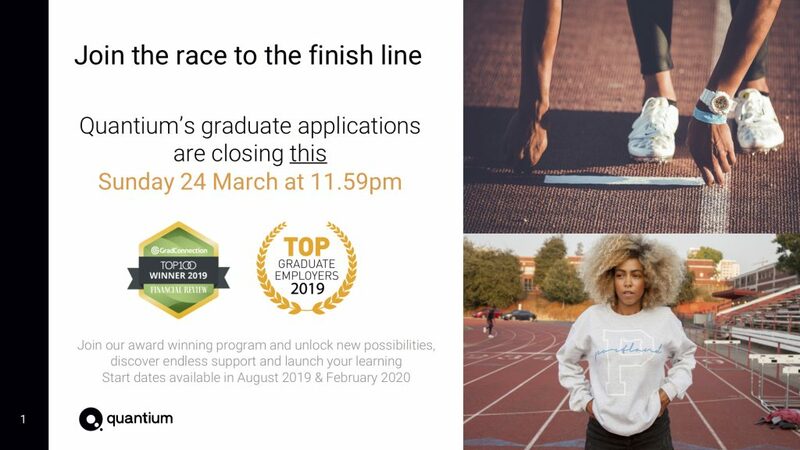 Time is ticking.Applications will close for EY’s 2020 Graduate Program and 2019/20 Vacationer Program on 28 March 2019. 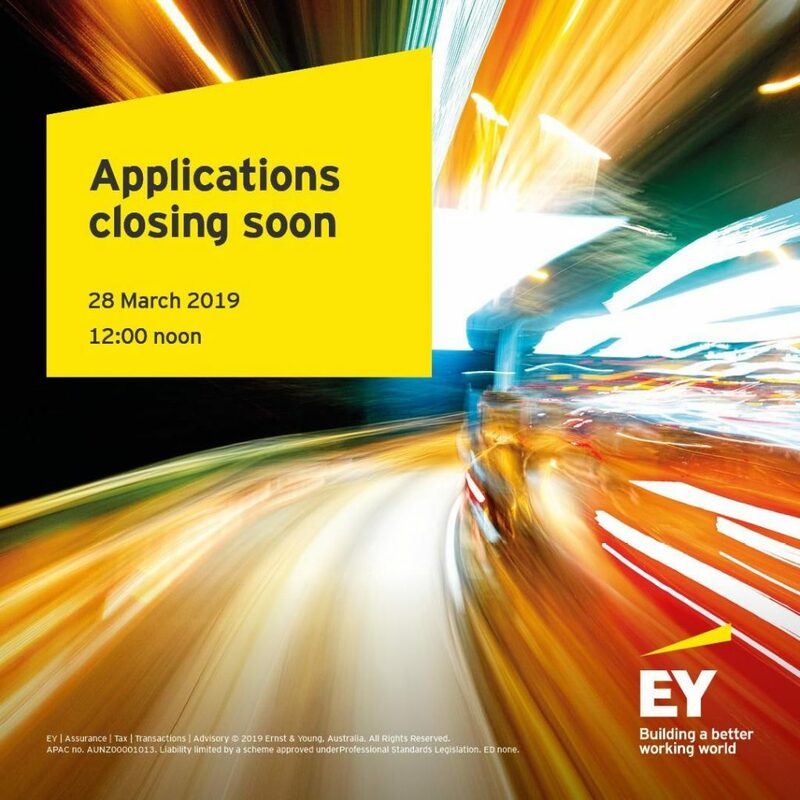 Visit www.ey.com/au/betterbeginsnow to apply now! So you’re a final year student and have studied your heart out, now it’s time to see where your degree can take you! 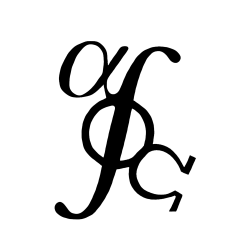 We know, we know… there are so many options out there for you – so why choose Quantium right? 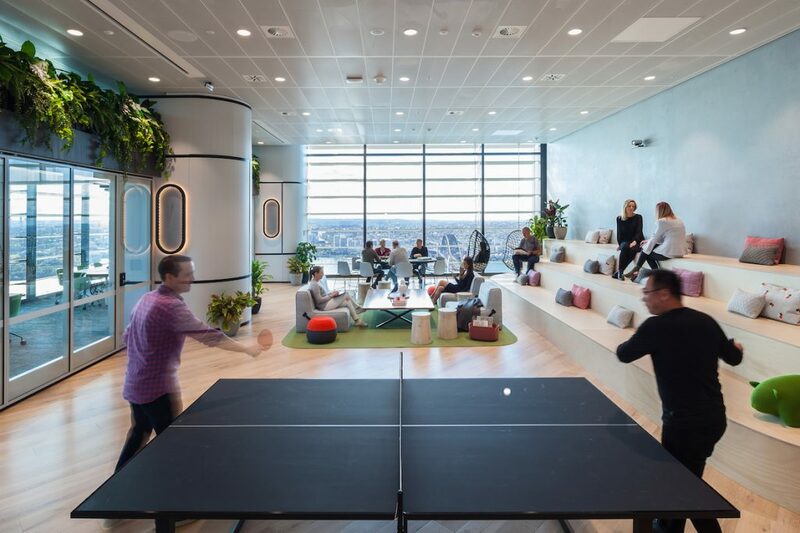 This is your chance to make an impact that matters, be part of an inclusive and innovative culture where work life balance is encouraged, and building your future is our priority. Join an award-winning Graduate Academy where your opportunities are endless and your voice matters. So what are you waiting for? Jump on it! Broadening the SOA’s reach internationally The post Global SOA Membership Highlights appeared first on The Actuary Magazine. The actuary of the future must emerge with new skills, knowledge and education The post Breaking New Ground appeared first on The Actuary Magazine.